With attention to the ways in which new reproductive technologies facilitate the gradual disembodiment of reproduction, this book reveals the paradox of women's reproductive experience in patriarchal cultures as being both, and often simultaneously, empowering and disempowering. A rich exploration of birth appropriation in the West, New Reproductive Technologies and Disembodiment investigates the assimilation of women's embodied power into patriarchal systems of symbolism, culture and politics through the inversion of women's and men's reproductive roles. 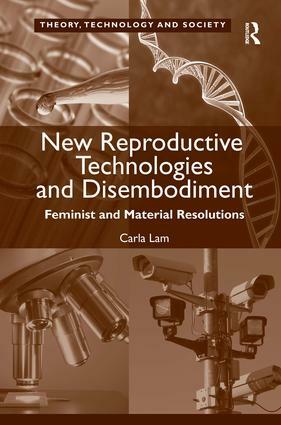 Contending that new reproductive technologies represent another world historical moment, both in their forging of novel social relations and material processes of reproduction, and their manner of disembodying women in unprecedented ways - a disembodiment evident in recent visual and literary, popular and academic texts - this volume locates the roots of this disembodiment in western political discourse. A call to feminist political theory to re-remember the material dimensions of bodies and their philosophical significance, New Reproductive Technologies and Disembodiment will appeal to scholars of sociology, gender studies, political and social theory and the study of science, technology and health. Carla Lam is a lecturer in the Department of Politics at the University of Otago, New Zealand.